Among many interesting ideas, Heidi Natura offers and explains the design behind this revitalized shoreline at the Chicago Botanic Garden. It’s not too late to rent a Bobcat and start digging in your lawn! But before you start any new pond project, we’d encourage you to watch this insightful 2 hour, 10 minute webinar from Great Lakes Sea Grant on Building a Better Water Garden. The webinar includes 3 distinct presentations, which cover the first hour of the video. Greg Hitzroth, Organisms in Trade Outreach Specialist at Illinois-Indiana Sea Grant, gives a project overview. Hitzroth introduces and explains the problems of invasive aquatic plants. Heidi Natura, Founder & Partner, Living Habitats (Chicago, IL), looks to provide ecological value within our water gardens and water features. She emphasizes natural designs that provide for calm, quiet spaces yet still furnish great aesthetic appeal. Bob Kirshner, Chicago Botanic Garden‘s Curator of Aquatic Plant & Urban Lake Studies, and Director of Restoration Ecology, has overseen a 60-acre system of lakes. Since 1999, Kirshner has been involved in bio-engineering 4.5 miles of shoreline. 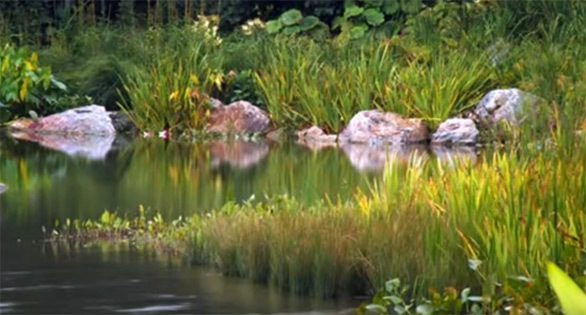 Kirshner presents plant species that are ideal for water gardens and naturalized shorelines. These are suitable alternatives to commonly used species that happen to be invasive. The second hour and ten minutes of the webinar features an interesting question-and-answer session between attendees and the webinar’s presenters.